PUBLIC PERSONA Depp’s portrayal of the charismatic outlaw is perhaps the most perplexingly muted of his career. Michael Mann is far from the first filmmaker to explore the concept of a legendary American law breaker as proto-celebrity. Public Enemies invites comparison to two motion pictures in particular — Arthur Penn’s 1967 milestone Bonnie and Clyde and Andrew Dominik’s 2007 masterwork The Assassination of Jesse James by the Coward Robert Ford. As even the most cursory comparison makes clear, Mann’s entry in this subgenre may be the latest, but it is far from the greatest. Which I find disappointing, being a longtime admirer of the director’s stylish, visceral body of work, which includes Thief, Manhunter, The Last of the Mohicans, The Insider, Heat and Collateral. The story of Depression-era bank robber John Dillinger would appear tailormade for Mann’s talents and sensibility, and yet it is possibly the flattest, least electric movie he has made. Of course, he didn’t muck this up by himself. Johnny Depp, for example, turns in a starring performance that takes restraint to new extremes. Beyond muttering his lines, flashing that smile and sporting period attire, he’s barely there, in stark contrast to the complex, larger-than-life characters he’s created in other films. The decision to take an understated approach is especially bizarre given that Dillinger was famously charismatic and fond of hamming it up for the cameras of both the press and the police. Not to mention psychotic. Depp plays an almost lobotomized version of the outlaw. Based on the 2004 biography by Bryan Burrough, the script by Mann, Ann Biderman and Ronan Bennett tells us virtually nothing we don’t know. We’re treated to nearly two and a half hours of reenactments: jailbreaks, bank heists, chases, shoot-outs. While artfully staged, they come off as peculiarly lifeless because we’re permitted so little insight into the psychologies involved. Christian Bale’s G-man, Melvin Purvis, is a cipher as well. J. Edgar Hoover (Billy Crudup) appoints him head of the FBI’s Chicago office and charges him with making an example of the headline-grabbing gangster. It’s in essence the same role Kevin Costner played in Brian De Palma’s The Untouchables (1987). Watch Bale’s clenched, inscrutable work here, and recall how many more dimensions Costner’s character had. Costner isn’t a better actor. The Untouchables is just a better directed, more richly written film. 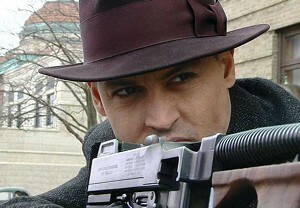 Public Enemies chronicles the final months of its subject’s life. Having escaped from prison twice, he makes the tragic mistake of believing he can hide in plain sight. Financial institutions were foreclosing on people left and right, so public sympathy was more likely to be with the robber than the bank. According to the script, Dillinger was convinced he could live the high life in Chicago and not have to worry about being turned in as long as he managed his image wisely. He refused, for example, to engage in kidnapping because he believed his public would frown on it. Among his miscalculations was his belief that he could openly conduct a romantic relationship with an attractive coat-check girl (Marion Cotillard) without compromising her safety. And that he could trust a Romanian madam by the name of Anna Sage (Branka Katic) and find safe haven in her brothels. Mann suggests that after one visit from Purvis, Sage was more than ready to assume her role as history’s most famous movie date — the Lady in Red. The truth, however, is that she herself contacted an old friend from the force and offered to set up the fugitive in exchange for $5000 and no more visits from the immigration authorities threatening to deport her. Reviewers as estimable as Roger Ebert have praised Public Enemies for its historical accuracy (“Mann is fearless with his research”), but the reality is that the filmmaker plays fast and loose with the facts. Sage’s role is misrepresented and the $5000 never mentioned. The film implies that Dillinger was estranged from his father when, in fact, the gangster was known to hide out in his home after pulling a job. No reference is made to his two marriages and, while he primarily targeted small-town banks, Mann has him bursting into marble palaces. Perhaps the most glaring departure from the record: While Mann suggests Dillinger felt safe in plain sight because he was famous and people idolized him, the truth had more to do with his undergoing plastic surgery to alter his appearance. Minor detail. Mann focuses instead on the sort of authenticity that doesn’t show up on the screen. He shot one of the jailbreaks in the jail where it actually took place. He shot in the very room where Dillinger holed up at the rustic Little Bohemian Lodge. He shot outside the Biograph Theater where Dillinger watched his last movie. Which is all well and good. It’ll make for a fascinating featurette when the DVD is released. It just doesn’t do much of anything to make this the movie it might have been. Mann would have done better to devote more attention to Public Enemies’ people and less to its places. As it is, this is a gangster film that, more often than not, shoots blanks.